January 2011 saw the passing of Professor Willi Dansgaard, a Danish geophysicist and paleoclimatologist who made tremendous contributions to the study of the Earth’s past climates through the study of ice cores. Before retiring in 1992, Dr Dansgaard was Professor of Geophysics as part of the Centre fore Ice and Climate research group at the Niels Bohr Institute at the University of Copenhagen for three decades. 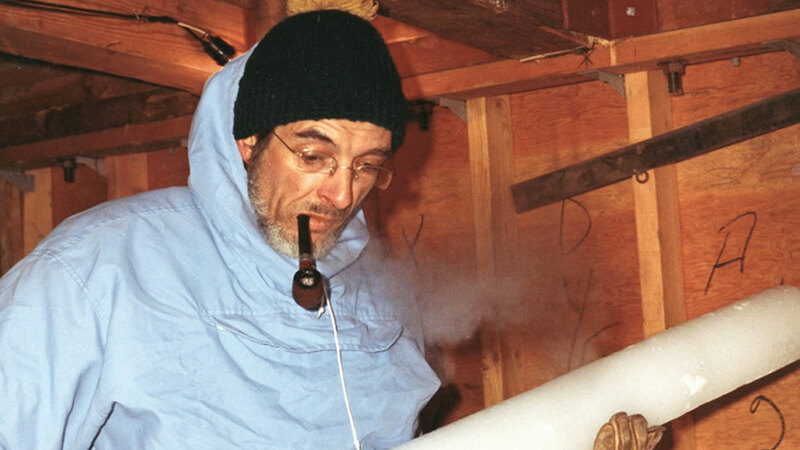 He will be remembered as one of the founders of what has become a major branch of paleoclimate research: the study of ice cores. This research involves extracting ancient ice from deep in the planet’s ice sheets, ice caps and mountain glaciers to see how the Earth’s climate has changed over the past hundreds of thousands of years. Ice cores provide scientists with uninterrupted, highly detailed records of the Earth’s past climates going back hundreds of thousands of years, making them a powerful tool for studying past climates. Cores drilled from the Greenland Ice Sheet go back as far as 123,000 years, while those extracted from the Antarctic Ice Sheet go as far back as 800,000 years. Professor Dansgaard’s contribution to the science of ice coring involved developing a method to determine how atmospheric temperatures have varied over time by looking at the ratio between two different isotopes of oxygen – oxygen 16 (16O) and oxygen 18 (18O) in the water molecules (H2O) found in ice cores and comparing them to the ratio of the same two oxygen isotopes in Vienna Standard Mean Ocean Water (VSMOW), the international baseline for water in terms of the isotopes of hydrogen and oxygen that make up water molecules. Knowing how this ratio of isotope ratios has varied over time is particularly useful in determining how global climate has varied in relation to greenhouse gas concentrations in the atmosphere (this can be done by looking at tiny air bubbles that became trapped as the snow deposited on the surface, then turned to ice as it became buried by subsequent layers of snow). Born in Copenhagen in August 1922, Willi Dansgaard studied physics and biology at the University of Copenhagen, after which he went on to work for the Danish Meteorological Institute (DMI) in 1947. While at DMI, Dansgaard spent four years studying the links between geomagnetism and meteorology in Greenland. His interest in the remote landmass, and in particular the massive ice sheet that covered it, would bring him to Greenland a number of times throughout his career. In 1951, Dansgaard returned to Denmark to take up a position in the biophysics research lab at the University of Copenhagen. As a specialist in stable isotope geochemistry, he used a mass spectrometer to identify different isotopes of oxygen in water molecules. Dansgaard was interested in seeing if the temperature of the atmosphere and the clouds at a given point in time could be determined by looking at the ratio of 18O to 16O in the precipitation which fell from them compared to the ratio of the same two isotopes in standard mean ocean water. Dansgaard set out to test this hypothesis by examining the oxygen isotope ratio in molecules from various precipitation samples. In 1952, a long spell of rain in Copenhagen provided him with an excellent opportunity. He collected rainwater in a beer bottle in his garden, emptying the rainwater every so often as cold and warm fronts passed over Copenhagen over a two-day period. In his analysis, Dansgaard saw that a higher amount of heavier 18O was present in the rainwater that fell from warmer clouds than in the rainwater from colder clouds. This is due to the fact that heavier water molecules with an atom of 18O have a 10% higher tendency to condense from gas to liquid more readily than lighter ones with an atom of 16O. In the years that followed, Dansgaard confirmed his findings by analyzing water collected from around the world, including samples collected by the International Atomic Energy Agency (IAEA), as well as samples he collected himself in the United States and samples of ice and snow collected from glaciers and icebergs in Greenland. Having samples form all over the world allowed Dansgaard to see that the colder the region where the precipitation sample came from, the lower the amount of 18O present in the sample. Some of his first analyses were published in 1964 in the journal Tellus B. Examining oxygen isotope ratios in freshly deposited precipitation was only the beginning, however. Dansgaard also wanted to have a look at precipitation deposited thousands of years ago to see if it would be possible to trace how temperatures have changed over time. The developing field of ice coring would provide him with a chance to look at paleoclimates. The principle behind ice coring is simple: As precipitation in the form of snow lands on the surface of an ice sheet such as the ones in Greenland and Antarctica, it turns to firn (hard, compact snow) and then ice as more layers of snow accumulate on top of it. As new layers of precipitation are deposited on top of the ice sheet and are eventually buried by subsequent layers, it creates a record of the state of the atmosphere at the time the snow fell. Extracting cores from deep in the ice sheet provides researchers with information about local climate (temperature, accumulation), regional climate (aerosols from marine and terrestrial sources), global atmosphere (well mixed greenhouse gas concentrations) and global climate forcings (solar variability and volcanic aerosols). The idea of digging into ice to look at changes in the climate had only been around in practice since the 1930s, when German researchers Ernst Sorge and Alfred Wegener analyzed the upper layers of ice of the Greenland Ice Sheet from ice they extracted from a pit. After the Second World War, and under the impetus of the International Geophysical Year (IGY) of 1957-58, the methodology developed from digging pits to using a drill to extract solid cylinders of ice from ice sheets in Greenland and Antarctica. In the 1950s, the Ice and Permafrost Research Establishment (SIPRE) in the United States and its successor organization, the US Army Cold Regions Research and Engineering Laboratory (CRREL), led the way by drilling a number of shallow cores in both Greenland and Antarctica. Eventually CCREL developed a thermal coring drill, which made it possible to drill ice cores all the way down to the bedrock underneath the ice sheet. After drilling a number of shallow ice cores in the early 1960’s at Camp Century, an American military base being built into the Greenland Ice Sheet, a team under the direction of physicist Lyle B. Hansen eventually succeeded in drilling the first ice core to reach the bedrock beneath the Greenland Ice Sheet. The 1,387 metre core drilled between 1963 and 1966 contained climate history going back more than 100,000 years, back to the beginning of the last glaciation on Earth. In the late 1950s and early 1960s, Dansgaard had himself been looking at ice samples taken from icebergs that had directly calved off of outlet glaciers in Greenland, not to mention shallow ice cores taken from the interior of the ice sheet during the EGIG (Expédition Glaciologique Internationale au Groenland / International Glaciological Expedition to Greenland). This allowed him to perform the first paleoclimate oxygen isotope climate dating of ice samples. But having heard about the coring activities CRREL had been undertaking, obtaining access to ice from the Camp Century bedrock ice core became Dansgaard’s main ambition. Dansgaard was able to visit Camp Century during a research expedition to Greenland in 1964, but American Military secrecy guidelines kept him from seeing the ice core drilling site. He would have to wait two more years before being able to get his hands on ice from the Camp Century core. He contacted Dr. Chester C. Langway, Jr., who had been in charge of CRREL’s ice coring operations, to ask if he and his laboratory at the University of Copenhagen could analyze ice from the Camp Century core. Langway agreed on the basis that Dansgaard had already been doing noteworthy work in the field of mass spectroscopy. Dansgaard and his team melted and analyzed samples of ice taken form the Camp Century core layer by layer. By plotting δ18O (one gets this number by taking the ratio of oxygen isotope ratios, subtracting 1 form it and multiplying the result by 1000) as a function of depth and thus the age of the ice, Dansgaard was able to show how temperatures in Greenland have fluctuated over the past 100,000 years. He published his findings in the journal Science in 1969. As expected, the most remarkable shift in temperature in the graph happened between the end of the Last Glacial Maximum about 21,000 years ago and the start of the current interglacial period, the Holocene, about 11,700 years ago. However some smaller temperature fluctuations during the last ice age, which lasted between about 110,000 and 20,000 years ago, were quite sudden. This came as a surprise to paleoclimatologists at the time. The conventional belief amongst the scientific community until that point had been that large-scale changes in climate happened only gradually over a long period of time. Dansgaard’s results had put this idea into question. A few years later, Dansgaard and other researchers also looked at the oxygen isotope ratios in the first bedrock ice core Hansen and his team drilled from the Antarctic Ice Sheet at Byrd Station between 1966 and 1968. The temperature data they were able to obtain from the 2,164 metre core went back almost as far back in time as the Camp Century core and showed similar temperature fluctuations to the temperture data they got from the Camp Century curve. However more deep ice cores from other locations would need to be extracted and analyzed to learn more. In 1970, CRREL, the University of Copenhagen and the University of Bern in Switzerland agreed to pool their resources and efforts in the Greenland Ice Sheet Program (GISP), which had as its aim to extract ice cores at different places on the Greenland Ice Sheet. Dr. Hans Oeschger –who had worked with Dansgaard previously and had worked on a method for determining the chemical composition of the air bubbles trapped in ice cores, making it possible to see how greenhouse gas concentrations in the atmosphere had fluctuated in the past – was also involved in the project. GISP extracted more than a dozen intermediate-depth ice cores throughout the 1970s. Its crowning achievement was a 2,038 metre ice core drilled to the bedrock at Dye 3, a now-abandoned American radar station in southern Greenland. The Dye 3 core contained ice going back nearly as far as the Camp Century core. Its curve of temperature fluctuations closely matched those seen in the Camp Century core. Dansgaard continued to be involved in ice core analysis until the end of his career. In the last major coring project he worked on before retiring in 1992, Dansgaard and his team at the University of Copenhagen led the multinational Greenland Ice Core Project (GRIP), which extracted a 3,028 metre bedrock ice core from the centre of the Greenland Ice Sheet between 1989 and 1992. A follow-up project called the Northern Greenland Ice Core Project (NGRIP) extracted cores from further north on the Greenland Ice Sheet, including one to a depth of 3,085 metres. Over the years, a number of other noteworthy ice coring projects have taken place. A 3,623-metre ice core that was drilled at the Russian Vostok Station in the 1990s, which holds climate information going as far back as 420,000 years and covers the Earth’s last four glacial cycles. Drilling at the Japanese station at Dome Fuji on the Antarctic Plateau reached a depth of 3,035 metres, reaching as much as 720,000 years into the past. The European Project for Ice Coring in Antarctica (EPICA) at Dome C on the Antarctic Ice Sheet extracted an ice core that dates back some 800,000 years, covering the Earth’s last eight glacial cycles. More recently, the West Antarctic Ice Sheet (WAIS) Divide project, finished drilling a 3,330 metre ice core in January 2011 not far from where the Byrd Station core was extracted. The North Greenland Eemian Ice Drilling (NEEM) project, is currently drilling another bedrock core not far from where the Camp Century core was taken and is expected to finish coring during the boreal summer of 2011. During his lifetime, Dansgaard won the Crafoord Prize from the Royal Swedish Academy of Sciences in 1995. He was a member of the Royal Danish Academy of Science and Letters, the Royal Swedish Academy of Sciences, the Icelandic Academy of Sciences, and the Danish Geophysical Society. In 2005, Dansgaard published a book with the University of Copenhagen entitled: Frozen Annals - Greenland Ice Sheet Research, in which he reflects back on his career looking at ice cores. The book details the major scientific findings of his career. However the most prestigious recognition one can have in the scietnific community is having something like a unit of measurement or an event named after you. The rapid fluctuations Dansgaard had first noticed in his analysis of the Camp Century came to be known as Dansgaard-Oeschger (DO) events, after Dansgaard and his colleague and friend Hans Oeschger. DO events consist of a cold period immediately followed by an abrupt climate change. Paleoclimate data from various sources has shown that DO events occurred 25 times during the last glaciation. Ice cores provide scientists with uninterrupted, highly detailed records of the Earth’s past climates.